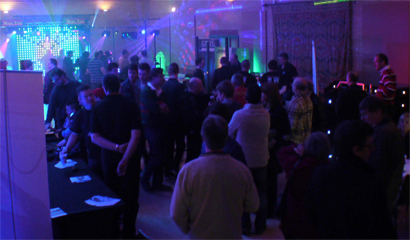 Popular mobile DJ retailer and regular Pro Mobile advertiser CRS1 will host its 9th annual Mobile DJ Show open event tomorrow (Sunday the 13th of January) in Lacey Green, Buckinghamshire. This year’s event will be in a different format to previous shows and feature a mixture of well-known brands as well as a few that you may not know as well as you thought! Confirmed manufacturers who will be demonstrating their latest products at the show include Bose, Pioneer, ADJ, Paladin, KAM, Chauvet, Panoramic Lasers and Virtual DJ. The event will also include an opportunity to try out the new Denon DN-D4500Mk2 as well as the latest DMX controller from Prolight Concepts. The Transcension LED Master 64 is ideal for up-lighting and other colour washing applications as it has the ability to assign/patch the control channels of different types of fixtures for consistent colour selection across a collection of lighting equipment from different manufacturers. Representatives from both NADJ and SEDA will also be present to discuss their respective associations and reasons why they are beneficial to mobile DJs today. The event will be held at the Lacey Green Millennium Hall, which is located opposite the CRS1 Showroom, Entertainment House, Main Road, Lacey Green, Buckinghamshire, HP27 0QU. The show will run from 2pm until 6pm and is free to attend, however those DJs planning to visit are asked to register on the dedicated Mobile DJ Show website so that the CRS1 team know how many visitors to expect.